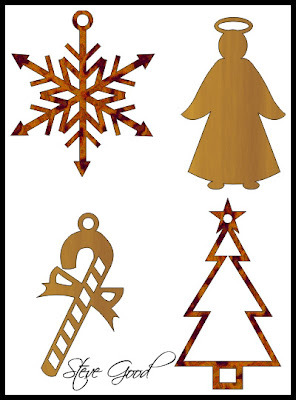 Here are a few more Christmas ornaments to cut. I usually stack cut 3 or 4 at a time from 1/4" wood. Use different species of wood so you get a nice mix of colors. Christmas ornaments make nice Christmas gifts. Make the four ornaments in this set and wrap them in a small gift box. You will be surprised how much a hand made gift is appreciated. Remember to add your certificate of authenticity.